All anti-lock equipped vehicles are designed with a wheel speed sensors (WSS), one at each wheel. A stator ring is then used with the sensor which attaches to the brake rotor, CV joint, rear axle or bearing hub. This stator ring has many metal "teeth" which create a magnetic field that is built up and then collapsed with the help of the magnetic sensor. This generates AC voltage which is then picked up by the computer. The faster the stator ring spins the more voltage is generated. To determine if a sensor has failed there are one of two methods that can be used. Connect a code tool to pin point the sensor, or check them manually. These sensors are subject to road conditions and vibrations which can cause them to short out and stop working. 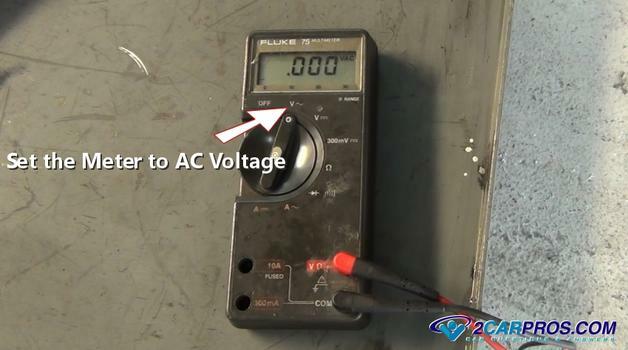 Follow the guide below to perform a sensor test using a voltmeter. Watch the video below to get an idea for what you are in for when testing the sensor. Then continue down the guide to pick up additional tips and information. Start once you have determined you are going to fix the problem, park the car on level ground with the transmission in park and the emergency brake set and the engine turned off. You may need to jack the car up to remove a tire for testing purposes and we prefer you learn how to do it correctly using jack stands. Through this guide you may need to remove a tire for testing and part replacement purposes. The tools, equipment and supplies seen in the article along with additional information using specific repair manuals are available at the end of this guide. 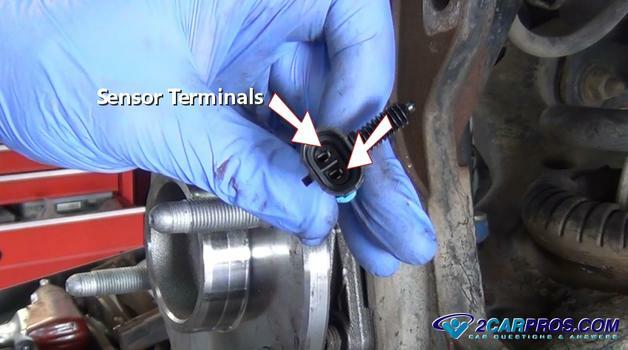 Locate the electrical connector from a particular the wheel speed sensor which is near the frame in the wheel well in most cases. Don't be confused by other wiring harnesses that may lead down to the wheel such as the brake pad wear sensor. Once located, disconnect the sensor wire at the connector by releasing the safety clasp and gently pulling it apart. The previous step will uncover the sensor electrical terminals which is what you will be using for testing proposes. The voltmeter probes will be attached to these terminals. Using a voltmeter with alligator clips attach the voltmeter leads to the sensor. 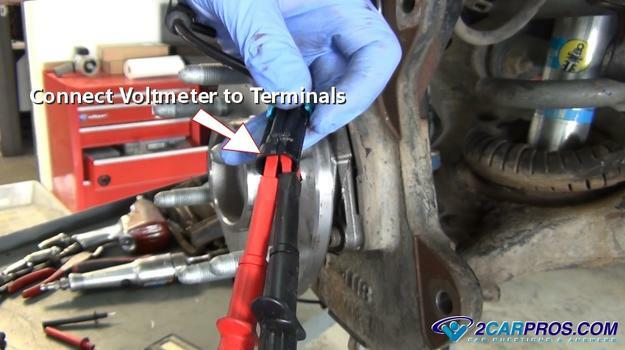 Be sure to not allow these test probes to touch together or the sensor will not test properly. Try not to use hand held probes because they can wiggle causing the voltmeter readings to fluctuate which makes testing more difficult and can offset the test. Once the leads have been connected set the meter to AC alternating current voltage. The meter will usually indicate AC voltage by a wave symbol. Once the meter is turned on it will fluctuate down to zero volts. Now the sensor is ready to be tested. While observing the voltmeter spin the wheel or hub to create voltage. 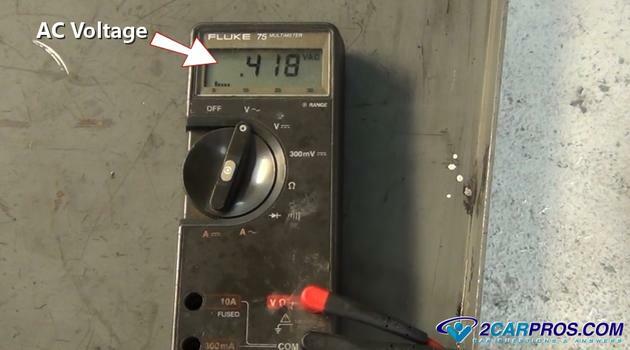 This voltage will vary according to the speed in which the hub or wheel is spun. As the hub begins to spin the voltage will rise and then decrease as it stops. 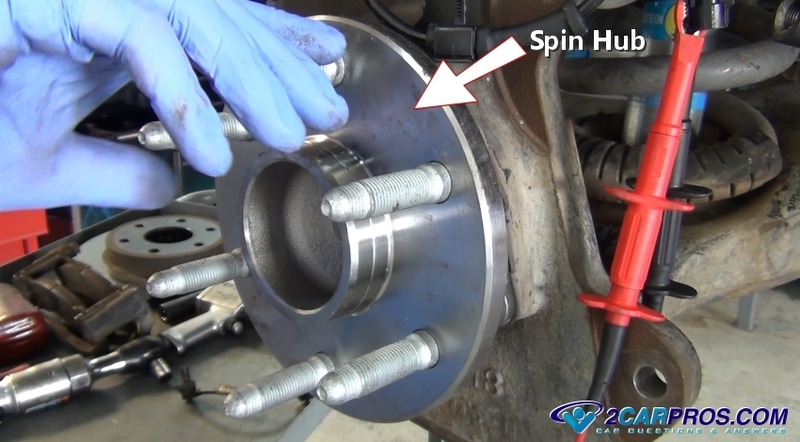 Slowly spin the hub or axle which will produce the voltage, if no readings can be found the sensor has failed and replacement is required. This is a typical reading from a wheel sensor. Configuration of the sensor mounting is different for each manufacturer but follow the same operation. In the image below a stator ring or as it is sometimes called a reluctor can be located inside the bearing hub, rear axle housing, or on the CV joint itself. Slowly rotate the ring to check it for damage or missing teeth. 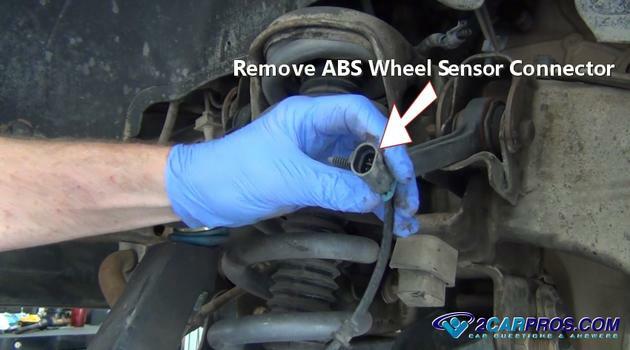 Wheel sensors are magnetic so check for metal shavings around the sensor which can hinder performance. 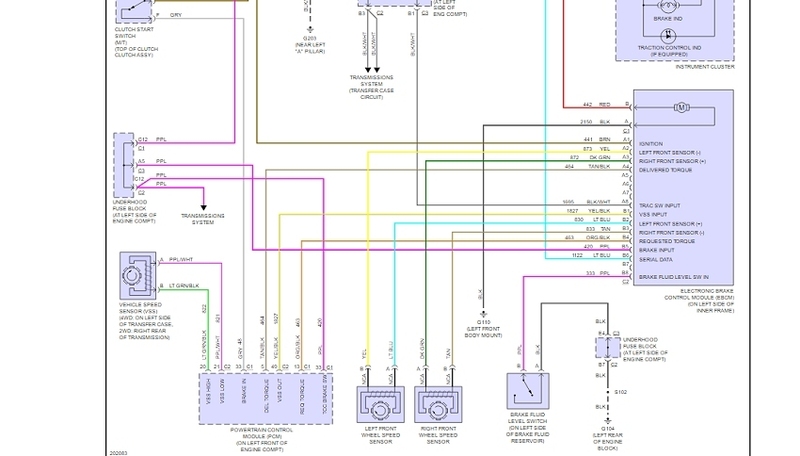 If you have gone through all these steps and you still have a code for one of the sensors the only other possibility is an open circuit somewhere in the wiring which can be found by a pin to pin check which test of the wiring. You will need to use a specific wiring diagram with a voltmeter set to ohms of resistance to check each wire from end to end. This will help detect a broken or shorted wire, once repaired it should turn the light off. 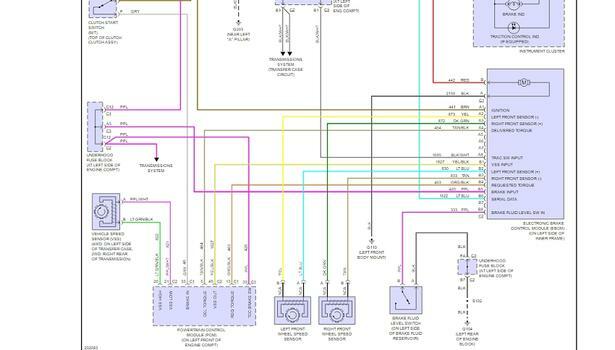 This is an example of an ABS sensor wiring diagram. 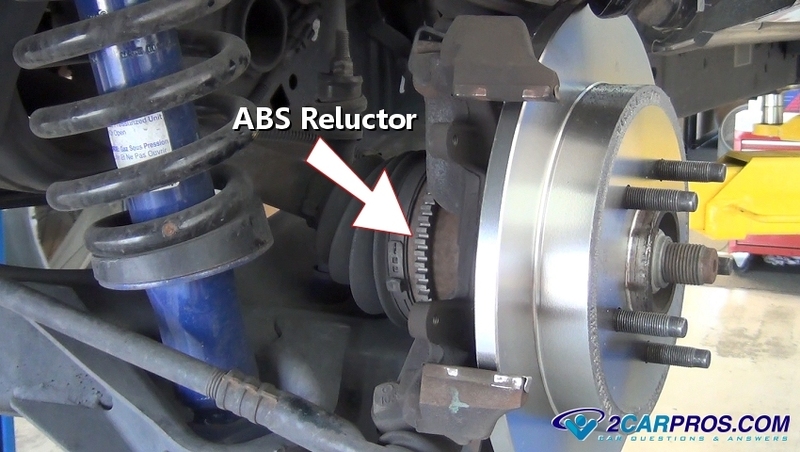 Be observant when first driving the vehicle after testing the ABS system. Listen for abnormal noises or performance issues that could indicate a problem which will need further inspection. If you have any questions about ABS testing visit our forum. Anyone can do car repair if he or she puts their mind to it. If you are a parent please show your kids how to do car repair because they will need to know this valuable information as well. Doing the job for yourself, family and friends will give you a satisfaction and pride which you can only get from doing the job right. 2CarPros will be there for you every step of the way with our repair guides, and if you have any questions our team of mechanics will answer them for free.